This week I attended my grandson’s cross country competition at one of Delaware’s scenic state parks. Its stone-lined walls and barely-mowed areas leave the protected land mostly as nature intended. The trails are perfect for the cross country runners, and the day welcomed them with glorious skies and low 80s temps. Before the race began, I walked along the edges of the park searching for a photo opportunity. Just above me on a small hill was a lone picnicker hidden in the shadows of the afternoon. When I saw WordPress’ Weekly Photo Challenge, this image flared into my thoughts. While summer winds toward its finale, everyday life can still consist of the outdoor meal. Picnics are the quintessential summer activity–one enjoyed by families, friends, lovers, singles, colleagues, and even strangers. In my part of the planet we are able to partake in this outdoor pleasure three seasons of the year. But occasionally we can venture outside during a winter’s spring-like surprise, and dine under the midday sun or midnight stars. Others are particularly fortunate to live in climates where picnics can be enjoyed year round. Dining outdoors can be one of life’s most delightful everyday activities–breakfast, lunch, afternoon tea and crumpets, and dinner. Nothing is needed, but a simple display of foods. Still, I think about elaborate feasts that are not the everyday, but conjure much more preparation. In the Lens section is the composition that drew my camera to eye. It says so much in so little. 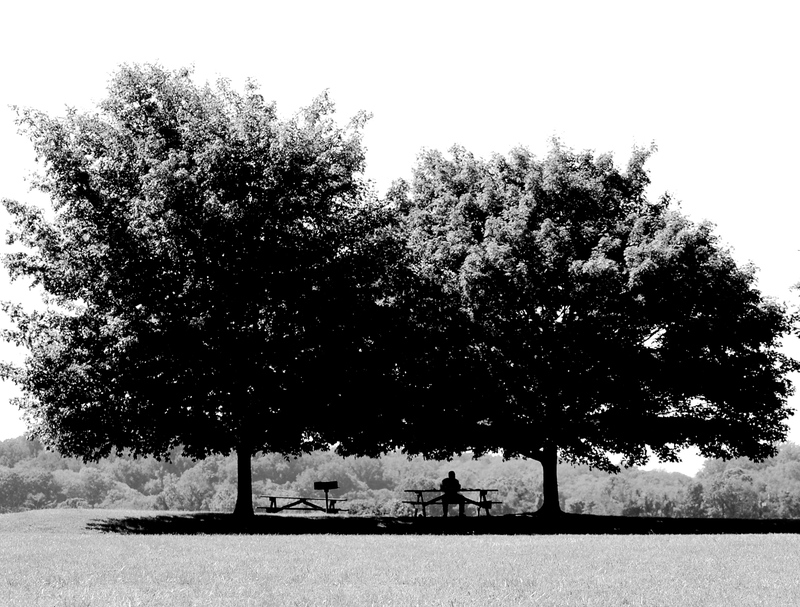 An elderly man is having an afternoon picnic, waiting for whatever the park provides as part of his solitude. He’s nestled between two stately trees, like bookends securing his spot. I envision him replicating this quiet scene over and over as an everyday part of his everyday life. Note: As usual I welcome any comment about this post or any part of my blog. This entry was posted in Black-and-White Photography, Human Nature, Photography, Writing and tagged Nature, Photography. Bookmark the permalink. It’s a such a peaceful picture full of ambience. A lovely composition and very graphical. I like the little man against the big trees. And I like the silhouette in the shadows against the sunlit park. It’s hard to make this kind of picture work in B&W, but you managed. Great work! Many thanks, yes, I’m sure that each of us can build a different narrative based on the scene. By the way each time that I read one of your posts, I need a few days to ponder your images and comments. You’ll hear from me today or tomorrow. The man under the tree reminds us about the simple joy and pleasure of nature, solitude, great food, of the joy of being together with the people that makes you laugh and smile. Beautiful images with dramatic black and white effect. Thanks, I felt the same way. It’s symbolic of the juxtaposition of nature and human nature at its (seemingly) most tranquil. Wonderful shot, Sally! I like how it was treated in B&W to show just the silhouette. Very nice shadows on that one. The strong lighting makes a good monochrome image. I’m intrigued by the power of the monochrome vs. the power of color images. Thanks. Thanks, I was drawn instantly to the scene. Thanks for the Pingback and for the visit. Many thanks for the Pingback and I’m off to see you site. Thanks for the Pingback and will view your site. Thanks for the Pingback and visiting. Many thanks for the Pingback. Thanks for visiting and the Pingback.